Animal welfare is an important part of pest control operations. The Australian Government has developed a number of Standard Operating Procedures (SOPs) to ensure animal welfare is taken into account when people undertake shooting activities to control pest animals. These SOPs have been endorsed by the National Biosecurity Committee and are to be seen as guiding documents to help provide a uniform approach to the management of pest animals. Using SOPs in conjunction with the SSAA Farmer Assist program’s own Code of Practice and our Humane Hunting Principles and Proper Shot Placement guidelines, activities can be conducted humanely in a ‘best practice’ manner. For many years, pest control focused on killing the most pests as possible at the cheapest price. In today’s society, there is now a pressing need to improve the humaneness of pest control methods. As a result, the Australian Government provided funding to create a process for assessing the relative humaneness of pest control methods and a model for humaneness assessment was developed as a result. The model was not designed to provide an absolute measure of humaneness but to enable a judgement to be made about the impact of a particular control method on the target animal. When a number of control methods are assessed and compared to each other, a decision can be made to find the most suitable option based on the relative humaneness of the method. The finished publication, A model for assessing the relative humaneness of pest animal control methods, includes a range of ‘humaneness matrices’. These humaneness matrices provide a simplified overview of the relative humaneness for all methods assessed for each species covered. 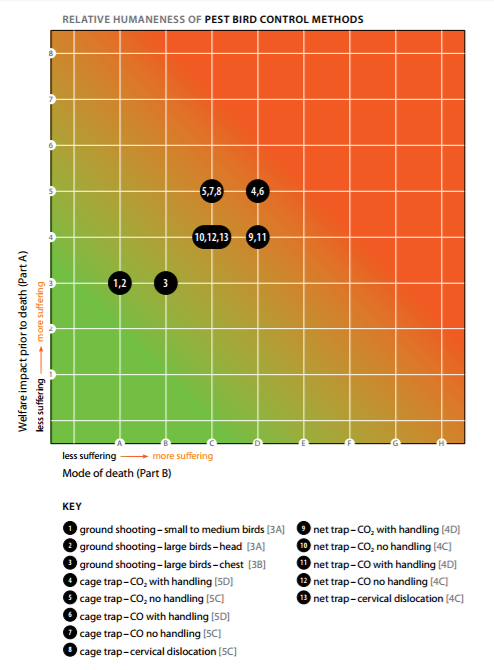 The humaneness matrices below represent the relative humaneness of feral cat and pest bird control methods. Methods in the green zone are more humane and the methods in the red zone are less humane. As the position of a method moves from green to red, it has an increasingly negative welfare impact on the target animal. 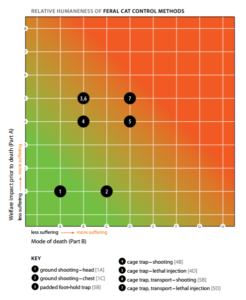 It can be seen quite clearly in these two examples (and in other humaneness matrices for other pest animals) that shooting is one of the most humane options to control pest animals. Head shooting delivers a projectile to the head/brain, causing fatal tissue and bone damage, and severe bleeding. This is regarded as the most humane method to kill a pest animal. Chest shooting delivers a projectile to the heart/lung area to cause an instant fatal stroke or massive systemic blood loss. Blood loss rapidly deprives the brain of blood, causing rapid unconsciousness and insensibility to achieve a rapid humane death.